After much publicity Pope Francis’ visit gain from the media, equally disappointing stories emerge. One of which is the condition of street children being rounded up and caged to ‘tidy-up’ the city, particularly those places that the Pope is going to visit. An investigation from an online media publication showed the horrendous situation the street children who were ‘rescued’ are in. 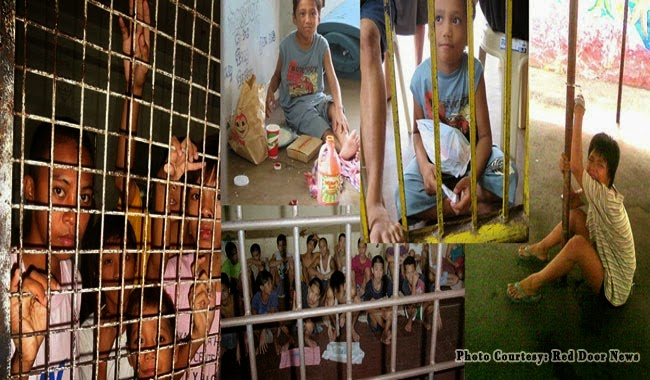 Some photos were posted showing how some children are being chained, and all are caged along side adult prisoners. The detention center was considerably filthy, and the children were reported to be fed with left-over food on the floor. They have no sleeping mattress so they slept on cold floors. They could also be easily abused or beaten by older inmates and adult prisoners. These children could be as young as five years old, and some were not even caught committing crime but was rather roaming the city looking for food and begging for some money. A confirmation from the head of Social Welfare Department in Manila, Rosalinda Orobia, was made stating that the local government unit was detaining street children in the areas the Pope will visit claiming that it is to ensure begging syndicates would not target the Pope. This statement had further outraged human-rights group commenting that such brutality and lack of compassion are completely inexcusable. This actually contradicts to what Pope Francis campaigned for; compassion and mercy.